My 2008 or What a Storyteller Does All Day Long: 12.21.2008 Sunday: Assembling. Picture of: the assembly line of family gift boxes. 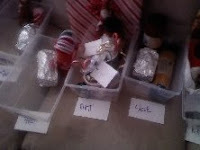 There are at least twelve sets of boxes we put together for families large and small. Today I: took my eldest to her agility compete; no business today; worked on holiday packages; had dinner and gifts at in-laws home; flat tire outside their house- brothers-in-law jumped in and changed tire for their older sister and brother. Thanks guys. Fast too; Happy Chanukah to Sarah and the rest of you who celebrate the feast. I'm just gonna act like I wasn't totally trying to see what was in those boxes you were assembling. Heh heh. LOL! Hehe, I never thought about that. Thanks for making me laugh this morning.